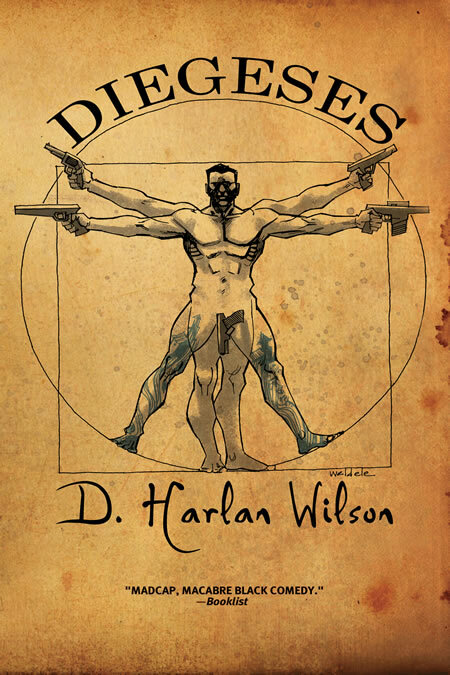 In Diegeses, acclaimed novelist and critic D. Harlan Wilson channels the schiz-flows of Ballard, Kierkegaard, Kafka, Burroughs, Deleuze and Guattari in two interconnected novelettes. "The Bureau of Me" and "The Idaho Reality" follow a man named Curd into the nightmarish prism of his own ego. In an ominous, darkly surreal near-future, Curd is visited by a group of mysterious strangers who claim to be representatives of the Bureau of Me. As he struggles to negotiate their weird aggression, he sinks deeper and deeper into alcoholism. The Bureau of Me suspects he is a becoming-god, but deification has its price. Inevitably he finds himself alone in a postapocalyptic wasteland, the last man, zombified physically and mentally. "The Idaho Reality" sees Curd rebooted from end-of-the-world subhuman to futuristic soap opera star. In a series of schizophrenic vignettes that mirror the condition of his psyche, he is turned inside-out. No longer the weak, insecure drunk he was in "The Bureau of Me," now he is an omnipotent television icon, although his penchant for hypermasculine assholery has shifted into high gear, rendering him more clown than becoming-god, degraded by the spectacle of simulation. Literary and grotesque, humorous and dismal, theoretical and streetwise, Diegeses is and avant-pop masterpiece that entertains as much as it enlightens, unstringing the complexities of the mind while tying them into new and undiscovered knots.